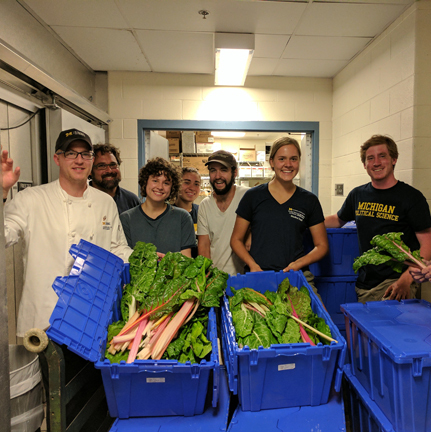 With the first delivery of Campus Farm fresh produce to Mosher Jordan dining hall on June 29, the university’s sustainability goal of using more local food products made another giant leap forward. And students -- both participants in the Campus Farm as well as those enjoying the delicious results -- are learning hands-on lessons about food sustainability, being an engaged consumer, and sources of essential nutrition. The Campus Farm began in 2012 and is a year-round, student-run greenhouse and farm space within Matthaei Botanical Gardens. It was founded by students in the University of Michigan Sustainable Food Program (UMSFP) and is a multi-stakeholder collaborative project of UMSFP, Sustainable Food Systems Initiative (SFSI), faculty and staff, the Matthaei Botanical Gardens and Nichols Arboretum. The Botanical Gardens and Arboretum manages over 700 acres of gardens, research areas, and nature preserves around the Ann Arbor area. Over the past five years, the farm has been building its soil and its infrastructure to grow primarily vegetables and herbs. With UMSFP and others, it also helps support several satellite gardens on campus including one at East Quad residence hall. On the farm students from across-the-board disciplines, who are interested in sustainability and environmental stewardship, work together to produce seasonable vegetables such as kale, swiss chard, cherry tomatoes, zucchini and much more. This partnership helps achieve a university-wide goal of purchasing 20 percent sustainably sourced food by 2025. Campus Farm was able to begin supplying its produce to dining halls after attaining its USDA Good Agricultural Practices (GAP) food safety certification. This effort was in part made possible by the addition of a covered produce wash station built by volunteers and student farmers. This partnership also creates a complete loop: students are growing the food, which is then prepared and served by students to fellow students. Food waste becomes compost which can then used on the farm, Turchan says. Year-round production using a passive-solar hoop house will help the farm’s production continue throughout the year and increase the opportunities for students to engage in the farm during the school year. Plans are to build two more hoop houses this year that will increase production and student participation while providing fresh greens for use in the dining halls all winter long. In addition to providing seasonal produce to their fellow students, student farm staff are participating in a valuable learning experience regarding food cultivation, our current food system, and sustainability, explains Jeremy Moghtader, farm manager. “It’s a conversation starter and creates a hands-on leadership development opportunity for students while raising awareness of food issues. It also has the potential to ensure that U-M students learn to be engaged citizens, and are more aware of the impact of food systems on public health, the health of the environment and our economy as well as the opportunities to be leaders and creative problem solvers in that space,” Moghtader says.